i decided it's time for a blog change... i've called my blog "musings of a wanderer" since i switched to the blogger platform in 2007. at that time in my life i was wandering... heck that year alone i traveled to 5 countries and only spent 3 months that year at "home" in pa. i was on a journey of discovering who i was and what i wanted to do with my life. i didn't feel like home was any one specific place so therefore i was a wanderer... making my home and taking up residence wherever i was at the time. fast foward to 2010. a lot has changed. i bought my first home in may and moved out of my parent's house, i got involved in a new church plant in the city i moved into and i'm settling more into my role at work. yeah, i still spent a month in africa, but i now know where home is for a while and i'm content with that. in fact it brings me so much to joy to say that! so i'm gonna make a few changes on the old blog here, which will hopefully lead to me posting more. i think i felt like i couldn't post about everyday life because so many people who read this blog do so soley to hear about my overseas adventures. and because, how can i post about my home when i call it "musings of a wanderer?" so now it's simply "the life of susan." 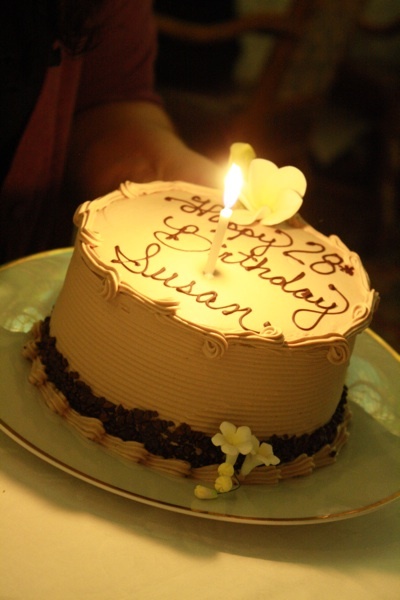 i've owned that domain (www.thelifeofsusan.com) for a couple years now and never really did much with it. so now it's linked up to the blog. i changed my twitter name to reflect that as well (@thelifeofsusan). afterall, that's what i want this blog to be about- my life. the ups, the downs, the good, the bad and the beautiful! so join me as i share about my adventures in being a homeowner... my obessions with all things crafty... my occasional worldwide adventures... my journey to being the best aunt ever to my 3 amazing nieces and oh so much more! i know i'm way overdue for a "i'm back from zambia and this is how i feel post" but honestly i'm not there yet. it's hard to describe what living in a village for a month and then coming back to america does to you. so forgive me for not being "there" yet, but it will come eventually. 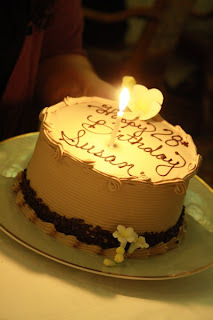 i felt the need to post today because it's my birthday and one of the things i do enjoy about having a blog is getting to look back at previous birthdays and see what i wrote. so this year is no exception! today marks 28 years since i made my grand entrance into this planet. wow typing it out makes it feel so real. in some ways i feel like that's so old, but at the same time still so young. once again i find myself looking over my life and reflecting on all that i've been through. this is usually the time where i think about where i wanted to be by this age, but nope- not this year. i'm not going to spend my day wishing i was somewhere else in life but i'm going to be thankful for where i am now and all that i've been blessed with! my family- i am so blessed to have such a wonderful family who actually enjoy spending time together and make it fun every time! my job- i hate even calling what i do a "job" because it's almost become like a lifestyle to me. working with hbb has challenged me and taught me to be a better leader. i mean come on, i get to travel and see people's lives transformed- it doesn't get any better than that! my house- i am so so so very thankful for my little house that is slowly turning into a home. this was one of the best things that happened this year and i still have to pinch myself sometimes to believe it's real. my community- i am so blessed to live in a community where there are people i can call on at a moment's notice. i love that we're all trying to live life together and learning what it means to serve each other in love. it's such a beautiful picture of what the church should be and it literally brings me to my knees at the beauty of it. i could go on and on about all the amazing people in my life who make me what i am today, but i want to keep this short. you all know who you are and i'm so thankful for each of you! today i choose joy and peace and contentment in the journey that God has me on... knowing that each day gets better than the last and each day i'm becoming a stronger, more compassionate, more loving woman. thank you lord for 28 years of breath in my lungs and life in my bones! can't wait to see what the future holds!